Abstract The segmentation of retinal blood vessels in the retina is a critical step in diagnosis of diabetic retinopathy. 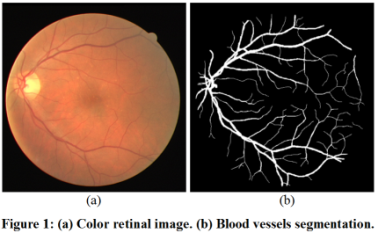 This work proposes a method for automatically segmenting blood vessels in retinal images. Five basic algorithms for segmenting retinal blood vessels, based on different image processing techniques, are described in the paper in  and their strengths and weaknesses are compared. A hybrid algorithm that combines the confidence outputs of each basic algorithm is described. The performance of each algorithm should be tested on the DRIVE dataset.